Will we achieve sustainable development – survey says yes! The results of the quick 3 question survey are in. The survey asked – is what we are doing sustainable and would we ever achieve true sustainable development. The survey was done partly online and partly face to face on mobile. In total there were 31 respondents, with 10 people answering anonymously online. Here are the questions, answers and my commentary. So a resounding 65% believe that what we are currently doing is not enough. Personally I thought it would be higher but maybe there were a few optimists or hopefuls that ticked the maybe answer. I think this is fairly representative of the majority of the people in the ‘industry’ and probably why there is so much green apathy out there. Just check out some of the comments in this article on The Fifth Estate. OK, there are probably lot’s of other things out there that could help us achieve sustainable development but I wanted to keep the survey short. Competitive Collaboration is one of my favourites at the moment, at the core of competitive collaboration theories is that competitors need a common vision or goal – yep, achieving sustainable development is a pretty hefty common goal. So, it can help save the planet, people want it, are you doing it? The final question. The future doesn’t look bright enough to wear shades but it’s not all doom and gloom. Over 50% of the respondents believe that we can achieve true sustainable development, the bad news around a quarter don’t think we will. And these are the guys in the ‘sustainbility industry’. The survey is still open so please feel free to answer the questions or pass on to your friends. How can we address the demographics of climate change? On Tuesday I wrote about how our changing demographics could reduce our per person carbon emissions by 20% by 2060 but our increasing population will wipe out the per person benefits creating a two fold increase in carbon emissions if we do nothing. But this demographic analysis of carbon emissions highlights an interesting fact – the greatest emitters in 2061 will be the 55-65 year olds. So what can we do with this knowledge? The 55-65 year olds in 2061 are currently between 0 and 15 years old. So the guys that will be the future largest polluting demographic are currently in school or close to it. Luckily our kids are being taught more about the environment, more about resource use, more about waste and more about global social issues than we were taught when we were at school. Now imagine how are school kids will be behaving when they are 55-65, imagine how different we would be if we were taught the things they are being taught at the moment. Will they be living like the typical current 55-65 year olds live? We have a great opportunity to change the future through our kids. Aging in place is probably one of the most important things to do for our again population. When we age in place we consume less resources to build more dwellings or furnish larger houses. Aging in place can be as simple as dual quay apartments or dual entry houses that can be used when the family grows as well as when the family shrinks or when a carer is needed. Aging in place could keep better control of our housing prices, reducing the booms and busts that demographics can create – just look at Japan. We have a great opportunity to change the future through changing our built environment. With an aging population and less young people to support the elderly it’s likely that we will end up needing to work later in life. If we do this are we likely to spend more and if we do then we are likely pollute more. We should understand this, work with this and put in place measures to make sure that if we do work later in life then we do so with less impact. We have a challenge ahead of us in how we reduce spending while working later in life. And there is of course the planetary limits of our one finite planet. So there will of course be limits on all demographic ages but should we have different limits for different ages? Should we be allowed to consume more resources in our growth mode (having families) and pay that back through reducing our allowances as we get older? Or should we have a lifetime resource budget that we chose to spend at whatever point we want in our life? Which ever way we tackle it, we need to do a lot more than we are now. Will our aging population save us from climate change? Harry Dent visited our Australian shores recently and was espousing that our aging population in Australia would cause a housing bubble to happen in the next 1-2 years. The premise being that when the baby boomers come to sell off their houses in retirement there aren’t enough Gen Xers or Millennials to buy them – low demand, high supply therefore price drop. Which got me thinking, what impact does our aging population have on climate change or more precisely our emissions? Here is the answer. First of all the aging population. Using Australian Bureau of Statistic (ABS) data we do indeed have a forecast aging population. By 2061 we will have shifted from 20% over 65 to 30% of the population over 65. We will have a declining 35% from 40% of the population aged under 30. So, yes we have an aging population but what has that got to do with climate change? Our material consumption has a huge connection to our emissions. Everything we consume uses materials and energy to make it, run it and dispose of it. So the more stuff we buy the more emissions we create. The good old IPat equation tells us that – Impact = Population x Affluence x Technology. 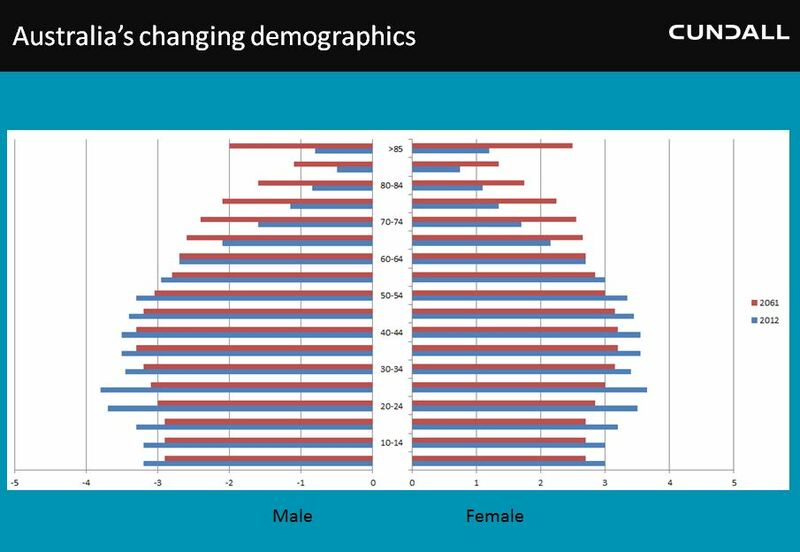 Harry Dent uses spending per household with the age of the wage earner to demonstrate shifting spending patterns with shifting age ranges. 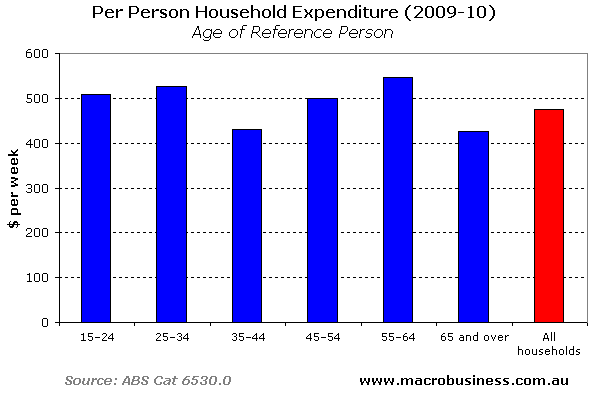 But in doing the research for this article I came across Macro Business who highlighted that this maybe isn’t the right proxy for demographic spending and they combined Harry’s research with ABS data to create a graph of spending per person for each age range. This is reproduced below. So, we have two spikes in age range spending the first when we move out of home and the second when we make our own family home at age 45. 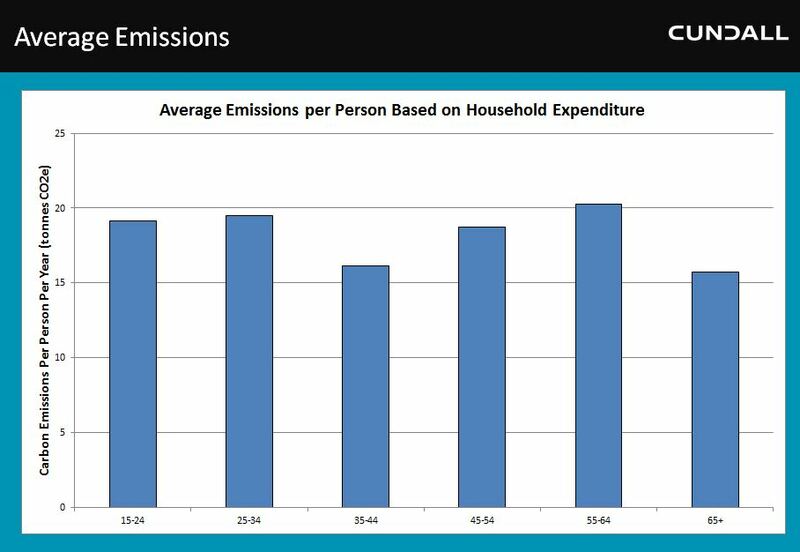 This spending graph can be used as a proxy for carbon emissions per person. We know the average Australian produces 19tonnes per year so we can create a demographic emission proxy per person. 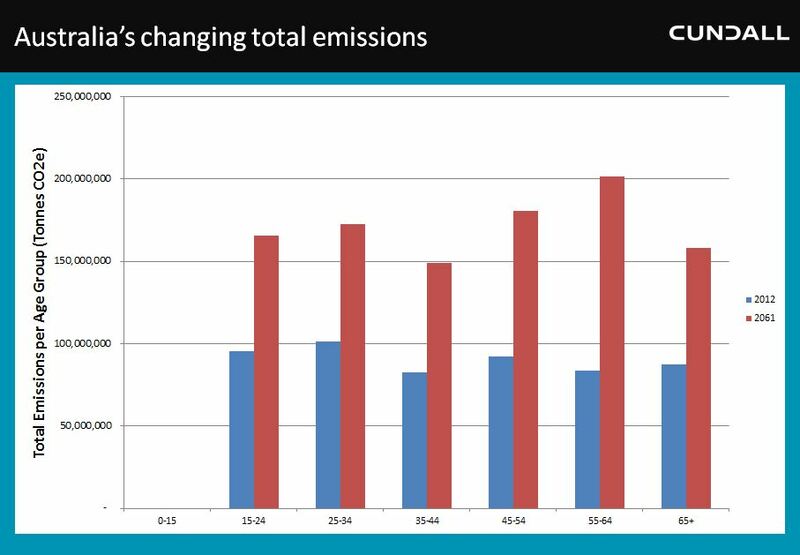 When we combine these two graphs we end up with a average carbon emissions per age range for Australia for 2012 and for 2061. As you can see in 2012 the greatest producers of carbon emissions where indeed the 55-64 age range but the lowest is the 65+ age range, so if we have an aging population then our carbon emissions should go down. Yep, if we did nothing about our emissions we would get a 20% reduction in carbon emissions purely from our changing demographics. So our aging population is changing our emissions per person but is it enough to save us from climate change? Remember the IPat equation where P is population – yep, you’ve guessed it P or population is the over riding factor. When we look at total carbon emissions per age range. The culprits shift from the 25-34 year olds in 2012 to the 55-64 year olds in 2061 and guess who they are – the current 0-15 year olds! So will they be consuming in the same way our current demographic bands do now? Knowing this information what should we do? That’s for Thursdays article – stay tuned. Australia’s worsening fuel security risk – how will you cope? 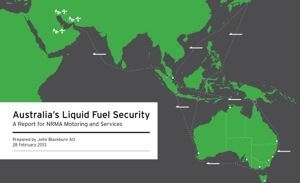 I wrote this original story about 6 months ago that focused on the liquid fuel security risk report by the NRMA. With the announcement by BP that they will be closing their Brisbane refinery the predictions by NRMA are starting to come true. The closure of the Brisbane refinery reduces Australia’s domestic liquid fuel production to about 45% of demand, with the majority of liquid fuel imports coming from Singapore into South Australia and then needed to be transported to the other states there are reasons to be worried. Are you prepared? I thought it might be timely to highlight the risk of our liquid fuel security, it is a “high risk, high likelihood” that we still aren’t taking seriously. Why is it timely? Asia Pacific extreme weather events. In February this year the NRMA (yep, the stalwart of liquid fuel use) produced an excellent report that highlights Australia’s risk to not only our own dwindling oil reserves but also the closure of Australia’s oil refineries – those things that convert oil to liquid fuels. The report has lots of verified data and graphs that highlights our worsening predicament. A summary. We currently produce only 60% of the oil that we consume within Australia, by 2025 we will only produce 30% of what we consume. That’s only 11 years away. By 2015 only 15% of the refined fuels consumed in Australia will come from australian oil refined in Australia. Almost a half will be from imported refined fuels – over 50% of the diesel consumed will be from imported refined fuels. There is the obvious impacts on transportation that we need to consider and I wrote about these earlier this year. But what the NRMA digs more into is the impact on pharmacy supplies and food. We currently only have enough fuel stocks, food stocks and pharmacy stocks for a week! If you need hospital care, you’ve only got three days! So could our supplies be interrupted that much? As at 2011 Singapore provided 51% of Australia’s petroleum products! As of 2014 NSW will be 100% dependent on liquid fuel imports, either from overseas or from refineries in Melbourne or Brisbane (Apr 2014 update – Brisbane is gone) – as will Tasmania, ACT and South Australia. Is it inconceivable that NSW could be without liquid fuel in a very short space of time? If any of those ports were disrupted by sever weather events that caused a blockage in the shipping channel, or piracy, or political disturbance! Imagine if it was the Singapore president that had his phone hacked – it wouldn’t just be military ties at risk. My recommendation is to have a think about how you would cope as a family if this was to happen because according to the NRMA report the end user – YOU – hasn’t been considered in the emergency or resilience planning that has happened as federal or state government level. Is it better to store rainwater in offices or just use mains? Rainwater and water of any kind is a precious commodity. We are being encouraged to store rainwater in office buildings by various industry bodies and government. But the question is – from an ecological perspective is it better to store rainwater in tanks and reuse within an office for toilet flushing or is it better to let the rainwater flow to the local catchment and be recovered as part of the overall water cycle? It is a question we get asked a lot so we did a lifecycle analysis of basement rainwater storage in an office building in Brisbane. Here are the results. First up the most important thing with lifecycle analysis, in my opinion, is to define the boundary. Are you looking at the impact of an isolated option in an isolated building or the impact of an unit flow in the entire system? This important first step is highlighted by the lifecycle analysis of rainwater storage in office buildings. A background of the options. Option 1 is easy. Use mains potable water that has been treated to drinking water standards to flush toilets and urinals. Calculate the amount of pollutants from the rainwater running into the local water course. 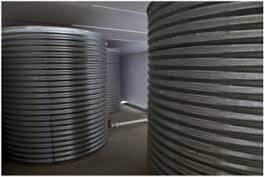 Option 2 install rainwater tanks in the basement of your building. Run separate pipes and risers from the tank to your toilets. Install filters and pumps. Calculate the reduction in pollutants running into the water course by reusing the rainwater on site. As can be seen its looking at an isolated option in an isolated building. Well, to my surprise rainwater storage turns out to be a better option by about 30-40%. Surprised? The largest ecological impact of two options was amount of energy that was needed to pump the mains water to the office building. I would have thought it was the excavation, concrete, additional pipework etc but no over 50 years its actually the water pump energy. But there is a proviso here. In option 1 for our office building the design didn’t use mains water pressure to circulate water through the building. It had a separate booster set to control the water pressure. Which meant that when we looked at option 2 we were already allowing for water pump energy so the rainwater option had additional pumps but no additional pumping energy. However, here is the proviso. If your option 1 uses the mains water pressure to circulate water through the building when you look at option 2 you will need additional water pumping energy. The result of this is that rainwater storage is still marginally better but only by about 2-5% and will vary by +/- 5% depending upon which state you are in. So the lifecycle result appears to show that rainwater storage is an ecologically better option than using mains water for toilet flushing. But what about if we considered the unit flow in the overall system rather than our isolated building? Let’s consider the unit flow as the ‘provision of water for toilet flushing’ and then work out the most ecologically effective way of getting there. So, we have already analysed two options for the provision of water for toilet flushing – option 1 mains water and option 2 rainwater on site and found that the largest ecological impact was pumping energy. So if we looked at the system rather than the building our response would be not how do we capture rainwater, it would be how do we reduce the ecological impact of the water pumping energy. The easiest option from an analysis perspective is to use renewable energy for water pumping. Now there are many ways you could do this and I am sure there is some smart nerdy stuff with water turbines etc but for the sake of an easy comparison let’s just say we use utility green energy as that allows for all the ecological impact of the renewable energy infrastructure etc. Option 3 stick with mains water for flushing the toilets but the water company uses green power. The result of option 3 is a 60-70% lower ecological impact than storing rainwater on site. So yes, rainwater storage on site for toilet flushing is the best option if we compare it to a high carbon energy source but that doesn’t its a better ecological option for Australia as a whole. The better ecological option for Australia as a whole is to convert the water utility to green power. But that will cost a fortune I hear you say. Well, the cost of installing, operating and maintaining the rainwater system in your office building would pay for 100 years of green power for the equivalent amount of water consumption. Now, yes this is just looking at the ecological impact. It doesn’t consider the water impact, the climate resilience in the system, the age of the municipal infrastructure etc. But what it does highlight is that bang for buck, or ecological bang for buck, making our municipal systems better is a much better option that local storage for Australia. Does your building have Impact? There is a new trend in investment markets called ‘Impact Investing’. Impact investing requires a positive social and ecological return alongside a financial return. 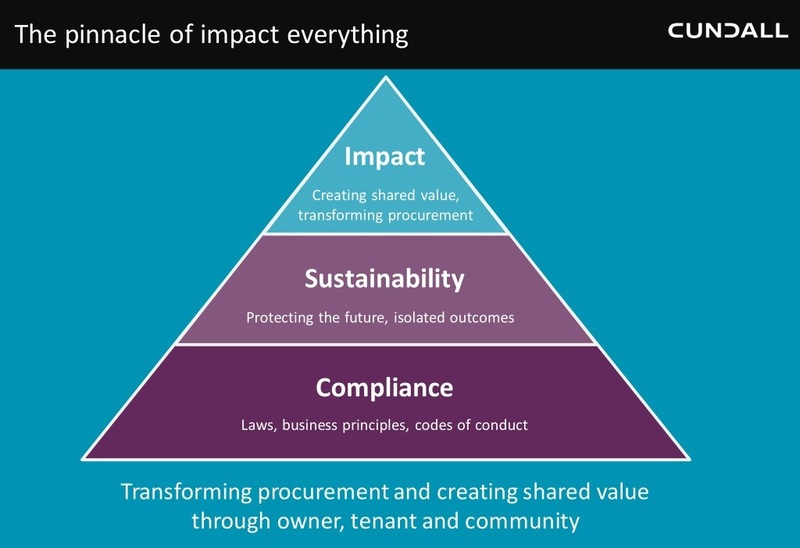 The question for property is – what impact will Impact Investing have on your assets? And how will you respond? The first of two posts explores the recent trend of Impact Investing and the second will answer the question of what impact it will have. A great article from Forbes sums it up nicely “Making Money While Making The World A Better Place”. The reason I and others in my field love the definition is that it flips the thinking of the environment on it’s head. We have been doing what we do for the last 20 years focused on ‘reducing environmental impact’, the impact investment focus flips it to ‘creating beneficial environmental impact’. It completely changes the way that teams, clients and users respond to approach a design problem. Lets create a positive impact means you are improving on the current situation, where as lets reduce our environmental impact means you are undoing a wrong. 3. The welfare state will be forced to be reconfigured as some government expenditures dramatically increase current sources of revenue. For example, life expectancy increases coupled with increased health care costs are projected to nearly double as a percent of GDP by 2040 in most developed countries. What will the market value of impact investing be? OK, all well and good but what does this mean to property and the built environment? Well, a lot of our superannuation and personal investments are plowed into property every year. Almost every company in the world works in a building of some description. We all live in buildings. We all use building of some description every day of our lives. Buildings and property will be impacted by Impact Investment. The next post will discuss the how impact investment will impact property and how you can prepare yourself for it.